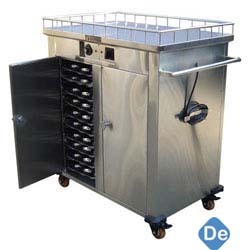 Electric Hot Food Service Trolley Manufacturer/Supplier in Delhi, Electric Hot Food Service Trolley in Delhi. We are one-step ahead of our competitors in offering a wide assortment of Hot Food Service Trolley. These are acclaimed for their application specific design, rugged construction and robustness. We ensure uninterrupted performance and maximum durability of our devices. These are very easy to use and ensure very less maintenance cost.